Gold does not rust, spoil or otherwise decay. But to Nassim Taleb, it is not antifragile. Gold may be physically durable and culturally indispensable as a store of value over the centuries. Yet the metal doesn’t itself thrive by becoming stronger as a result of the inherent and unpredictable variations in conditions that the world constantly presents. 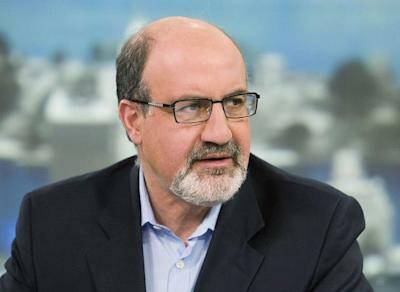 In his first U.S. lecture on the new book – to a group of institutional investors at the Strategas Research Macro Conference in New York on Thursday – Taleb stressed that antifragility is not synonymous with more familiar attributes such as stability, resilience or robustness against threats. Think instead of natural systems or species that become healthier through and, in fact, require exposure to varying conditions and intermittent stresses. Humans do better over time with variable exposure to temperatures and food intake; forests require naturally occurring fires to prevent the dangerous accumulation of flammable material. A longtime options trader, Taleb links these ideas to how something behaves in relation to volatility. An antifragile investment or organization experiences very small losses most of the time yet huge payoffs in moments of disruption, like owning an option. Pursuing a strategy aimed at suppressing volatility or trying to offset natural variations in markets, weather or other conditions is necessarily doomed, in Taleb’s argument. Those interested and willing to dive into the mathematics behind his theories can look at this Google Doc file Taleb has circulated. People get weaker, he says, by living their lives in controlled 70-degree rooms, and preventing or snuffing out small forest fires is a sure way eventually to produce a disastrous, uncontrollable blaze. “Anything organic requires ‘variability stressors,’” he insists. This view makes Taleb intellectually hostile to several features of today’s modern economies and markets. Beginning with Chairman Alan Greenspan in the 1980s, the Federal Reserve sought to achieve a low-variation, moderate glide path for the economy, forestalling cyclical downturns with easy credit, and thereby allowing plenty of dry underbrush to pile up. “And then Greenspan goes to Congress to say how a forest fire had never happened before,” goes one of Taleb’s laugh lines. In addition to activist central banking, tremendous debt and deficits at the national level, he believes, make the system more fragile rather than less. Debt at the personal, corporate or local and state levels is less problematic because decision makers are more directly tied to the consequences of mishandled finances. Very large banks likewise undermine their own well-being and jeopardize longevity, under this concept. They are built to be “robust” – to have redundant systems and heavy defenses against operating and technical stresses. But extreme size, while excellent for efficiency under “normal” conditions, can make the institutions more vulnerable to small threats. Potential losses from each incremental change in market prices or liquidity conditions can accelerate rather than simply increase in a linear way. Taleb claims a given bank failure makes another one more likely, a sign of an unhealthy system, whereas in air travel, each mistake is studied so minutely and the lessons applied so broadly that the system becomes safer following each incident. Remaining exposed to normal variations and occasional stresses is good, within a reasonable range – or, for investors, given a stable base of ultra-safe assets. Taleb, who also runs a “tail risk” hedge fund, has long espoused placing, say, 80% of one’s assets in very secure, slow-to-move assets to ensure one’s long-term financial viability, with the remainder in highly speculative paper. One leg of the strategy is “completely paranoid,” and today might include cash, the euro (“they are conscious of deficits”), silver, agricultural land. The other should be “completely aggressive”- toxic, high-risk/high-reward instruments, including some stocks. Shooting for a mid-level return by assembling what’s meant to be a mid-range collection of investments leaves an investor open to the fallacy that one can engineer against inevitable but unpredictable volatility events. He scoffs at the standard practice of measuring risk as demonstrated historical volatility. “That coffee cup there has never broken before,” he points out. The historical volatility of its existence is zero. Yet we all know it is quite fragile and under certain circumstances will surely be destroyed. Given Taleb’s conviction that overgrown banks and rampant money creation are badly destabilizing the financial system, it’s natural to think he would take refuge in gold, which is why a conference attendee asked him whether gold represents part of his stable-value portfolio ballast. He answered that he used to believe in this role for gold. But now, he says, “It’s too neat a narrative, gold.” He seems to mean that gold owners believe too avidly in the inviolability of the metal, and have constructed too elaborate a reassuring story about why it must perform as expected. Taleb likes to relate the story of an extremely successful commodity trader who dealt only in green lumber, who one day mused to a floor colleague that he was surprised people pay so much attention to wood painted green – not realizing the name referred to fresh-cut unseasoned lumber. This gets at the idea that a supposed understanding of an investment rationale, a narrative or a theoretical model is unhelpful in practical trading. A fair argument against Taleb’s big-picture view opposing aggressive central-bank intervention and heavy government debt today is that it pretends we can return to a point before original financial sin. Once decades’ worth of dry brush created the worst conflagration in memory, today’s policy makers perhaps can be forgiven for trying to put it out and using flame retardant to shut down flare-ups until we can recover. Do Institutions Own Input Capital Corp. (CVE:INP) Shares? What Kind Of Shareholder Owns Most Sartorius Aktiengesellschaft (FRA:SRT) Stock? What Kind Of Shareholders Own ETS Group Limited (HKG:8031)? What Kind Of Shareholders Own Highlands Natural Resources plc (LON:HNR)?